Prevalence of hepatitis, chronic anemia, speech or language difficulties, autism, anxiety or depression, dermatitis or atopic eczema, and cancer were not assessed in RHS 2002/03. E = high sampling variability – interpret estimate with caution. Source: CICH graphic created using data adapted from the First Nations Regional Longitudinal Health Survey (RHS) 2008/10, National report on adults, youth and children living in First Nations Communities. https://fnigc.ca/sites/default/files/docs/first_nations_regional_health_survey_rhs_2008-10_-_national_report.pdf -accessed July 20, 2017. Allergies and asthma were the most diagnosed chronic health conditions with both seeing a slight decrease from 2002/2003 to 2008/2010. In 2008/2010, dermatitis or atopic eczema was diagnosed in 7.5% of First Nations children living on reserve with the average age for diagnosis being 2.2 years of age. 1First Nations Regional Longitudinal Health Survey (RHS) 2008/10, National report on adults, youth and children living in First Nations Communities. https://fnigc.ca/sites/default/files/docs/first_nations_regional_health_survey_rhs_2008-10_-_national_report.pdf-accessed July 12, 2017. 2The International Polar Year Nunavut Inuit Child Health Survey, 2007/2008. http://www.inuithealthsurvey.ca/pdf/Child_Inuit_Health_Survey_Aug_31.pdf-accessed August 27, 2017. Due to the utilization of different methodologies across two rounds of the First Nations Regional Health Survey, it is not always possible to assess longitudinal trends in health status for First Nations children 0-11. 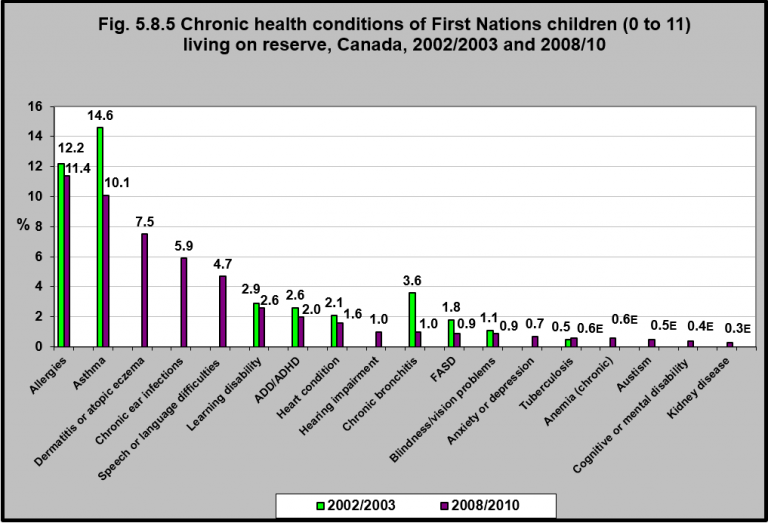 While there have been improvements in a number of chronic health conditions since 2002/2003, at least 50% of First Nations children diagnosed with these conditions were undergoing some form of treatment, suggesting that some First Nations children are unable to receive treatment due to barriers to receiving health care.1 These barriers to access to health care need to continue to be addressed. 1First Nations Information Governance Centre, 2012, p. 376.